Carbon Fibre is a very high end product designed to be extremely stiff and strong. Because it has more strength, there can less material and less weight too. The rigidity of carbon fibre means that it will not deform under impact, which can lead to cracking or damage to the outer surface or structure of the carbon weave. Contrary to common belief this material is not delicate. It takes a significant impact to cause damage. As in all composites, the material does not crack from the inside but rather from the outside, with the crack subsequently extending inwards. Because the damage starts on the outer surface, we are able to repair cracks, hairline fractures and breaks with confidence using materials that will show up any and all damage. The repair process involves the removal of the damage and re-laminating the carbon using the correct weave and tensile strength. The tensile strength is measured in MSI (million pounds per square inch), with this unit of measurement we can guarantee that the repair will work and react in the correct manner. 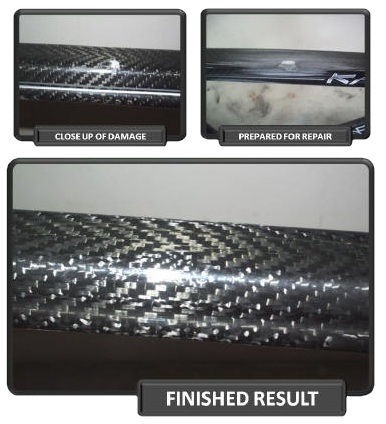 At this point you have a perfect carbon fibre repair, with a 5 year guarantee. All for a fraction of the cost of replacement.